For the past ten years I’ve been on staff with Joni and Friends, an international ministry founded by Joni Eareckson Tada. It has been amazing to get to know Joni and hear her vision for reaching those with disabilities with the message of hope that Christ offers. 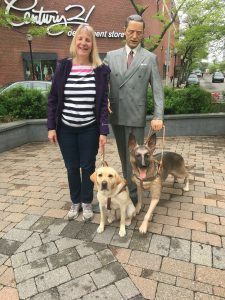 Recently, Joni featured my seeing eye dog, Thelma, and I on her daily radio show. She shared a bit of our story and we were so honored to hear it.